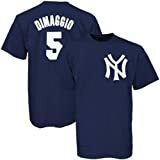 Joseph Paul DiMaggio, born Giuseppe Paolo DiMaggio, Jr. (November 25, 1914 – March 8, 1999), nicknamed Joltin' Joe and The Yankee Clipper, was a MLB baseball player center fielder who played his entire MLB career (1936–1951) for the New York Yankees. He was the brother of Vince DiMaggio and Dom DiMaggio, both major leaguers. He was born in Martinez, California, and moved to San Francisco at one year old. The family name was often spoken in the media as "di-MA-gee-oh" (with a short-a) but was more properly pronounced "di-MAH-zhee-oh". A 3-time MVP winner and 13-time All-Star who was widely hailed for his accomplishment on both offense and defense, as well as for the grace with which he played the game; at the time of his retirement at age 36, he had the fifth-most career home runs (361) and sixth-highest slugging percentage (.579) in history. He is also the only player in baseball history to be selected for the All-Star Game in every season he played. Below are DiMaggio's stats for his three Most Valuable Player seasons. While you're at it, check out the strike-out frequency. How about that! For Joe's career stats, click here. 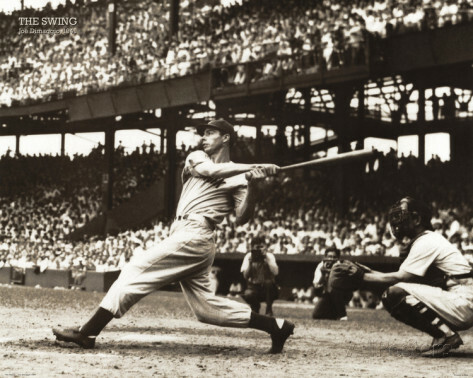 Featured here are Joe Dimaggio posters, photos, giant collectibles and apparel.